Papua New Guinea with its rich and diverse culture and history must work towards training more people in the archaeological field to preserve this heritage. In its Women’s Empowerment Series, the US embassy hosted a seminar to talk about having more women in the field of Science and Technology to positively contribute to the nation’s progress. Dr. Meghan-Tomasita Cosgriff-Hernandez, an anthropologist with the U.S. Defense Prisoners of War (POW)/ Missing in Action (MIA) Accounting Agency said various social environmental factors such as lack of promotion, lack of role models and mentors and gender stereotyping suppresses women. She says with the diverse culture of PNG there must be more emphasis on preserving it and women must be exposed to such opportunity. 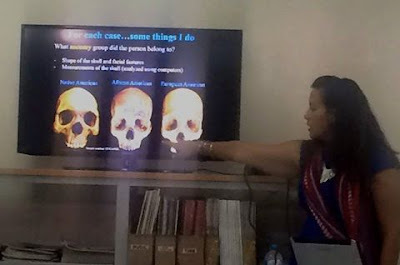 The anthropologist told the women who gathered at the American Corner in Port Moresby that women play important roles in the society and therefore can do more when it comes preserving culture and history. Dr Hernandez along with her team has been working in PNG campsites to uncover the remains of U.S soldiers missing during the war.